Nothing generates more collective excitement than the start of summer, with its promise of long days in the sun and endless fun for all the family. When it comes to protecting your children from the damaging effects of sun exposure, however, the long summer months can provide a bit of a challenge. From arguments about not wanting to wear sticky sunscreen to trying to keep your child protected as they jump in and out of the pool, effective sun protection can feel like an impossible task. 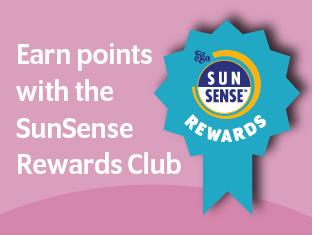 At SunSense, however, we believe that you and your kids should be able to enjoy the sun without having to worry. That’s why we’ve put together this handy guide, so you can easily protect your children from the sun and get on with enjoying summer! Babies have very delicate skin which is both thinner and contains less melanin than the skin of older children and adults. This means that babies’ skin is much more susceptible to sun damage. Many sunscreens designed for children say that they are suitable for children over six months in age and this is because children under that age should be kept out of direct sunlight. If you’re going to have a new baby this summer, it is important that your pram has an appropriate sunshade and that you keep your little one covered with long, loose clothing, sunglasses and a hat. Exposing your baby to the sun may increase their risk of skin cancer later in life. One of the best ways to protect children of any age (and adults as well!) from the sun is to keep them in the shade. This is particularly true between 11am and 3pm, when the sun’s UV rays are at their strongest and can cause the most damage. 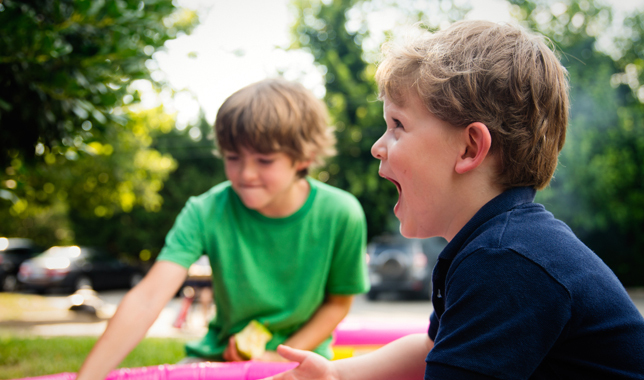 Encouraging children to play in the shade is a good way of protecting them from sun damage while they enjoy playing outdoors during the hot summer months. There’s plenty of fun to be had under the trees! Choosing the right sunscreen is a really important step when it comes to protecting your children from the sun. As children have delicate skin, you should choose a formula that has been created specifically for children, without harsh chemicals that could cause irritation. You should always use sunscreen with an SPF 50/50+, the highest allowed under the Australian Standard, with a broad range UVA and UVB cover. It is also good to use a kids’ sunscreen that is water resistant, like SunSense Kids SPF50+, so you don’t have to worry about the SPF being affected when they are getting sweaty, swimming in the pool, or towelling dry. You should reapply sunscreen every 2-4 hours as directed on the bottle and after swimming or towelling. Children’s skin is more delicate than ours and it’s important that you take this into account when choosing a sunscreen. Sunscreens that contain chemical absorbers, lanolin, fragrance or colour are more likely to irritate your children’s skin or cause a reaction. You should check the label for these ingredients, and any others that you know your child is allergic to. It is best to choose a sunscreen like SunSense Sensitive, which is designed for children’s sensitive skin and has an easy-to-apply formula to soothe as it protects. Sunscreen is a good way to protect children from the sun, but nothing is more effective than covering up. Dark coloured clothing with a tight weave will block out a large percentage of the sun’s UV rays, giving your child significant protection against sun damage. Whenever possible, you should keep your children covered up in long-sleeved, loose clothing. This is true of any prolonged sun exposure; even if your children are swimming they should cover up with a t-shirt. Don’t forget about a hat and sunglasses either! Protecting your child’s eyes from sun damage is just as important as preventing visible sunburn. Many parents are very conscientious about keeping their child protected from the sun at home and on holiday during the summer months, but do you know if your child is protected at school? You should talk to your kids about the importance of wearing sunscreen every day, even when it’s cloudy, and reapplying it at school. Many sunscreens come in small sizes, or even roll-on packaging, that can be easily slipped into a schoolbag for effective sun protection all day. Paller Amy S., Hawk John L. M., Honig Paul, Chin Giam Yoke, Hoath Steven, Mack M. Catherine, Stamatas Georgios N. New Insights About Infant and Toddler Skin: Implications for Sun Protection. American Academy of Pediatrics 2011.